Robin Marlena Itzler has worked in some facet of marketing, communications or training throughout her career. Recognized for her marketing expertise, Robin is the Marketing Maven for the “Orange County Breeze,” where her columns intertwine marketing and politics. She and her husband own Royal Care Pet Sitting, which has been serving pet owners since 1998. Their love for animals began as humane shelter volunteers where for nearly 20 years they walked and bathed rescued dogs. A former NASD licensed securities representative, Robin once served as president of the Animal Assistance League of Orange County. In 2011, she founded Motivate Your Something. Along with her autobiography, Life Is an Open Seating, Robin promotes her belief that everyone has at least one challenge in life that makes getting to the starting line harder. What is Robin’s something? She is legally deaf. 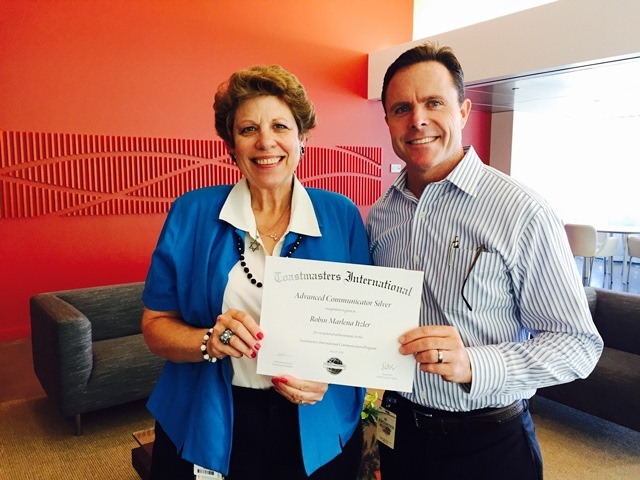 Senior Communications Coordinator Robin Itzler recently earned the Toastmasters Advanced Communicator Silver award. Robin joined Toastmasters in 2009, after she had agreed to be a keynote speaker at the Pet Sitters International (PSI) 2010 annual conference. Her journey started in 2007, when she originated the “Market My Words” column in PSI’s World magazine. Robin wanted to share her marketing knowledge with fellow pet sitters who loved animals, but lacked a basic understanding of how to market their business on a shoestring budget. A few years later, PSI announced plans to hold their 2010 annual conference in San Diego and invited Robin to speak at the event. She thought her “speaking” at the conference would be hosting round tables. How bad could it be? I’ll be seated at a table with a handful of people? – She would have to speak for 90 minutes to 50 pet sitters who were paying an additional fee to hear her presentation on promotional items! – Two days later, she would speak for another 90 minutes to 150 sitters about success in a competitive market! – Contact the president and admit she’s not a public speaker and decline the invitation. – Do the best she can and hope no one throws tomatoes at her. – Join Toastmasters International to learn and improve her public speaking skills. The first Toastmasters club was founded in Southern California, which is why clubs within Orange County are part of the Founder’s District. Today, there are nearly 15,000 clubs in 126 countries. Robin joined the Bre’ahs club, which meets twice a month during the lunch period. She immediately discovered that she liked to speak in public and made club history, earning the Competent Communicator and Advanced Communicator Bronze awards in record time. Realizing the multiple benefits of becoming comfortable at public speaking, she organized Purrfect Bark in Nationwide Pet’s Brea office. For several years, associates helped one another improve their communication skills, putting on several entertaining lunch and learn presentations for Brea coworkers. Today, Robin gives presentations as time permits, but has plans to do more public speaking through the company she founded: Motivate Your Something. Next month, she will be the guest speaker at the Hearing Loss Association of America Laguna Woods chapter meeting. Toastmasters is for anyone who speaks in any kind of environment. The organization empowers individuals to become more effective communicators and leaders. If you would like to learn more about Toastmasters, please email Robin Itzler. Consider coming with her to a Bre’ahs club meeting to find out more about the organization – and then you can join Bre’ahs or find one closer to your home. Surrounded by supportive members along with a proven program, Toastmasters helps members strengthen their communication skills. After all, every time you speak, it’s public speaking – all that changes is the size of your audience.